If you’ve been considering life insurance, you’ve most likely heard financial planners and advisors tout the benefits of term life insurance. Term life insurance is known as the cheapest and most popular type of policy available. This is because there are dozens of different kinds of term life insurance policies addressing every life situation you may be facing, not to mention the fact that it is typically the most affordable coverage for a person of any age. Determining the best type of term life insurance for you depends on multiple factors, including your age, health, present and future income, assets and liabilities. There are many types of term life insurance policies, among them level term, increasing and decreasing term, high risk, survivorship, group, guaranteed, no exam, and mortgage life insurance. Level term offers a low, fixed premium and stable death benefit for a term of 5, 10, 20, or 30 years. With decreasing or mortgage term life insurance, the death benefit and premiums decrease each year based on the insured person’s age or the principal owed on the mortgage, allowing the cost of the policy to adjust as your income increases year after year. Decreasing term life insurance, similar to mortgage life insurance or credit life insurance, is usually used to cover a debt like a mortgage loan and both the death benefit and premiums decrease over time as you pay down the liabilities. Banks, lenders, or financing companies may sometimes require life insurance as collateral for a business or personal loan, too. Some term life policies may be renewable at the end of the term. It is important to check the policy provisions to see if a medical exam or physical is required at the time of the policy renewal. Generally, renewable life insurance offers more benefits to young individuals or parents since rates of renewal policies are not as cheap as an insured person grows older. Renewable policies are a low cost alternative to permanent life insurance policies – whole and universal. Young people may want the benefits of whole or universal life insurance, but not be able to afford the premiums in their budgets. Convertible term life insurance allows the policyholder to change or convert the type of policy from term to whole or universal life when their budget permits. With convertible life insurance, families and seniors still have the protection of affordable term life with the option to purchase additional coverage with options at a later date. This is a good low cost option for individuals who intend to use life insurance as part of financial planning. If, for any reason, you think you would be ineligible for or denied coverage by the insurance company, you can apply for a no medical exam policy. Although the premiums will be higher, this type of life insurance exempts you from the usually physical exam and blood tests required for underwriting. Instead, you will be asked to answer questions regarding your current state of health as well as offer a full medical history. The death benefit is typically limited, but older applicants or ones with pre-existing health conditions are able to get enough protection to cover final expenses. Other terms and conditions or exclusions may apply, such as no payout or claims covered for the first 2 years after issuance, so read the fine print when considering no exam life insurance. Who Should Buy Term Life? Since rates are largely based on the age and health of the insured person, a term life policy offers the cheapest premiums and greatest advantage to young individuals in good health because they can lock in the cheapest premiums for 20 to 30 years. The bottom line is – any time you have someone financially dependent on you, you likely need to buy life insurance. Life insurance can be pretty hard on the wallet. In fact, many people forego getting life insurance altogether because they think it costs too much. My response to that – “B.S. !” A recent study by LIMRA proved this showing that consumers overestimate the actual cost of life insurance by 3 times. 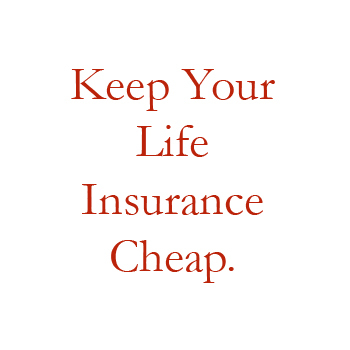 If you are healthy, life insurance is cheap. The study showed that a healthy 30 year-old male can get $250k of coverage for roughly $150. That’s $150 for the entire year! Okay, now that we understand that life insurance is cheap, let’s address some of issues that can cause your life insurance premiums to increase. The price of life insurance relies on a variety of factors, many of which can be controlled by you. By making a few lifestyle changes and shopping around, life insurance can be something that is very affordable and not hurtful to your budget. One way to lower the costs of term life insurance is to stay in good health. Duh, right? Insurance companies base premiums on the health of the individual. If you are considered to be high risk, your premiums will be higher. People who are overweight, frequent smokers and drinkers, have pre-existing conditions, or partake in high risk behaviors will have higher premiums. For example, if you are buying life insurance online and are a diabetic, it may be hard to find insurance. Keep in mind it’s not impossible as we’ve helped plenty of diabetics get life insurance. You’re just not going to get approved for a Preferred Best rating class. People who partake in activities such as sky diving, extreme sports bungee jumping and other risky behaviors will have higher premiums as well. If you are a smoker and have had health problems in the past, you will also be considered high risk, and therefore will have to pay higher premiums. What really affects your life insurance rate is when you have multiple health issues. Being a diabetic won’t hurt you as much. But if you’re a diabetic, overweight, have high cholesterol, and smoke; then expect your life insurance rate to be considerably higher. To prevent this, simply try to live a healthier lifestyle. People who live risk-free lifestyles and are in prime health will have no problem getting term life insurance, and will get lower premiums as well. Getting life insurance online quotes nowadays is super easy and should only take you a few minutes. Just be sure to shop around when buying life insurance, or at least partner with an independent agent that has the ability to shop around with multiple carriers. One recent example was a guy who contacted me that already had a $1 million term policy with New York Life. He was paying around $1,400 a year for his policy and thought he had the best rate. When we shopped it around we found several carriers that were significantly less with the cheapest coming in at $800 a year. He saved over $600 and all he had to was make a phone call! I had a similar experience when I consolidated all my term policies into one $2.5 million term policy. I was able to get $250k more coverage for $400 less per year. Remember this: Life Insurance is a commodity. A knowledgeable independent agent will be able to assist you finding an affordable term life policy than an agent that only represents on carrier. Buying life insurance does not have to be difficult and definitely should not be overlooked because you think it costs to much. Have you put off buying life insurance? If so, what’s holding you back?